The king of the Kaiju, Godzilla, has had a very chequered cinematic history. From the classic original Japanese films to Roland Emmerich’s 1998 disaster, the famous beast hasn’t always been given the respect deserved of such an iconic monster. Now, 16 years after Emmerich’s critical flop, Monsters director Gareth Edwards resurrects the gargantuan reptile in this year’s reboot, simply titled Godzilla, but is it a return to form? Yes, is the short answer. From an engaging story to a stellar cast, Edwards recreates the fan favourite with the utmost care and attention, and comes out smelling of roses. Bryan Cranston (Breaking Bad) stars as Joe Brody, an American nuclear power officer living and working in Japan with his wife Sandra (Juliette Binoche) and their son Ford, just as a nuclear disaster begins. Fast-forward 15 years and a disheveled Joe is trying to find the truth about what happened at the nuclear plant, believing the authorities are trying to hide something from the general public. As his descent into madness continues, a fully grown Ford, played by Aaron Taylor-Johnson decides to come to his aid. What ensues is a great story of father bonding with son as they try to work out exactly what is going on together. Though what they find shocks the globe. Within the first hour of Godzilla, the titular monster’s appearances are limited to shots of spines poking from the ocean, keeping the audience guessing as to how the creature has been designed by Edwards and his team. This can become increasingly tiresome as we make do with the film’s primary antagonists MUTO, and as impressive as they are to look at, all we really want to see is Godzilla in all his glory. Though Edwards’ constant teasers are brilliantly varied. Thankfully after numerous jaw-dropping set pieces ranging from a Japanese nuclear plant to a Hawaiian airport, Godzilla is finally revealed and the result is exceptional. Gone is the T-Rex on steroids look that Emmerich shoved down our throats in the 1998 monstrosity and in its place is how the beast used to look in the original foreign classics – of course with revolutionary special effects to keep things looking tip-top. The CGI, of which there is a huge amount, is breath-taking. Godzilla, the MUTO and all of the set pieces are of the highest quality, with no visible lapses whatsoever, and what Edwards does that so many other directors don’t is to keep the story going instead of letting the CGI take over, it never becomes overly loud and obnoxious. 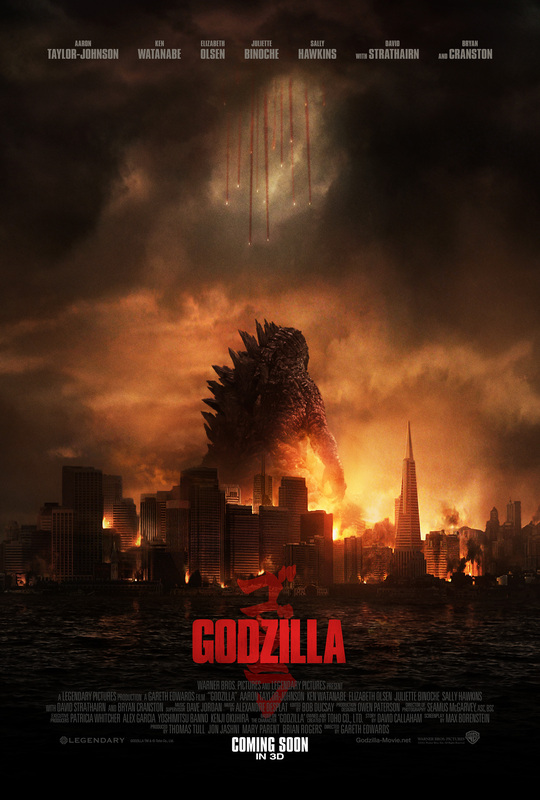 One scene in particular, involving a group of paratroopers infiltrating a desolate San Francisco as Godzilla and the MUTO do battle is probably one of the most beautifully shot and eerily quiet action sequences in cinematic history with one section involving some perfectly positioned Chinese lanterns being the highlight. A really enjoyable aspect of the film is spotting the homages to previous Godzilla films as well as other monster classics like Jurassic Park. There are many scattered throughout the film. Moreover, the acting is generally very good. 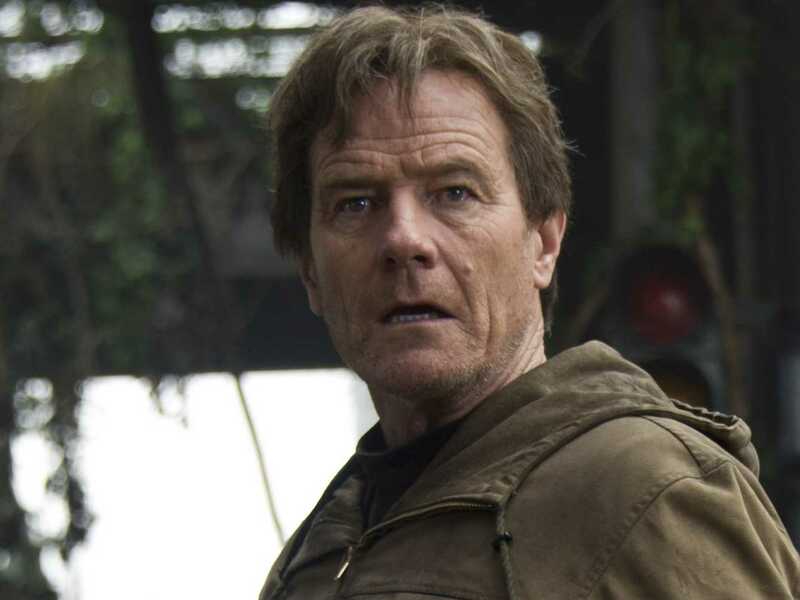 Cranston is sublime and shows what a brilliant actor he is. The character of Joe is the one you care about the most throughout the film. Taylor-Johnson is good, if a little staid as the generic armed forces stereotype. Elizabeth Olsen, David Strathairn and Sally Hawkins also star. Unfortunately, a weak link is Ken Watanabe who plays Dr Ishiro Serizawa. His over-the-top and hammy performance begins to grate after an hour of seeing him on screen. Thankfully though, Godzilla’s inevitable weak points are far outshone by the incredible special effects, interesting story and excellent acting. Bryan Cranston is a real highlight and the beast himself is a wonder to behold. Gareth Edwards has not only created one of the best monster films ever with some of the most breath-taking shots ever seen on celluloid, he has also whet our appetites for Colin Trevorrow’s Jurassic World set to be released in June next year – that can only be a good thing. Overall: Simply stunning, a must see! Sounds really good! Can’t wait to see it! Thanks for your comment Beckie, it’s definitely worth a watch. Many thanks for your comment Emma, it’s definitely worth a watch and one of the best films I’ve seen for a long time. Enjoy it!